Not even James Bond would scoff at the beautiful Hyper-Sub. After all, how could he not want to step foot onto a $3.5 million submersible powerboat? 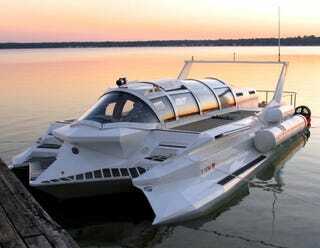 On the powerboat side, it's a heavy-duty, 31-ft. surface-cruiser with an enclosed cabin. Powered by twin 440 hp inboard diesels for a total output of 880 hp, the Hyper-Sub has a maximum surface speed of 40 knots and a maximum surface range of 500 miles. In dive mode the Hyper-Sub can plunge up to 250 feet, and offers umbilical SCUBA support.